A web platform for sharing resources | Clarity Innovations, Inc.
Technology & Learning received funds from Dell, Lenovo and Adobe to build a vibrant online community to share information about 21st century education solutions. The project, though relatively small, helped to provide educators learn practical information through a dynamic, intuitive portal. Technology & Learning Magazine commissioned us to rapidly build and deploy a content management system to publish articles and resources about meeting the needs of today’s learners. We worked closely with Technology & Learning to transfer the knowledge and expertise to manage online communities and enable them to replicate the success of our work for their other online properties. Our engineering team tailored an installation of Drupal to serve as the Web platform and augmented it further with additional modules and custom code. We modified its information architecture to accommodate a new set of templates we created from a Web design provided by the client. After populating the Web platform with content, we managed its migration to the client’s technology infrastructure. 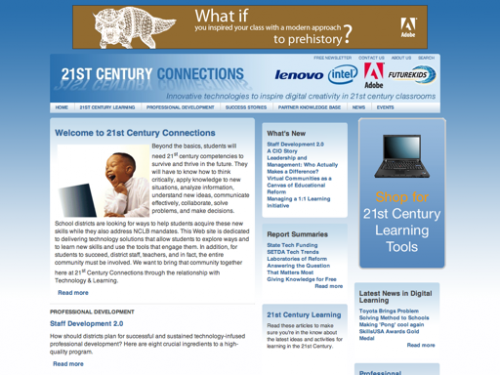 Educators seeking a place to learn about all aspects of 21st century skills visited the Web site frequently before being decommissioned by the client in March 2009.